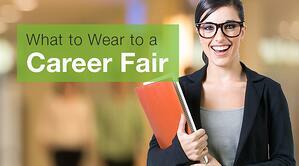 There are many things to do when getting ready for your first career fair. Don't forget to plan your wardrobe while you are perfecting your resume and practicing your interview responses. Your clothes play a major role in creating a positive first impression. You may need to wash, borrow, or buy items, so give yourself plenty of time before the day of the fair. Before we continue I do want to preface what is about to be said here. In today's day and age, the idea of being told what to wear might be offensive to some. Now would be a good time to point out that you are free to wear whatever it is you want. You should never be made to feel uncomfortable by the clothes you wear. However, just like how you are free to construct your resume as you see fit, there are societal norms that a lot of employers have become accustomed to seeing. If anything, dressing within these norms is a good way to show a potential employer that you understand "the game" and are willing to be a team player. So, with that in mind let's look at what to wear to a career fair. Even if you are applying for jobs at tech companies or landscape engineering firms that are known for more casual dress codes, it is wise to dress conservatively. It's always better to be a little over-dressed than under-dressed. CareerBuilder has some excellent advice on how to dress conservatively and professionally. Chose neutral colors for your skirt, pants, or jacket. Neutral colors like blue, black, gray, or tan look more professional than bright colors like pink, red, and yellow. Pair these with a natural beige, white, or ivory shirt or top. Save brighter colors for tie accenting or jewelry. Professional clothing can be expensive. By planning ahead, you can still dress well on a student budget. Alumni often supply career service departments with professional clothing that students can wear to career fairs and interviews. Remember that several students will attend the career fair, so act early. Contacting the department early may give you a wider range of choices. If money is an issue, talk to your career advisor. Even if you college or university doesn't have a formal wardrobe program, the career service team will have connections with community resources and help you find everything you need. You do not necessarily need a suit. A clean, well-cut jacket with gray, navy, or black pants is plenty. Wear a light-colored shirt or oxford. Look for a shirt with a pattern. Even though the pattern is hard to see, it acts as a camouflage for lint or pet hair. If you spill coffee and it leaves an outlining stain, the pattern will make it harder to see. Wear a conservatively-colored tie. If you have never tied a tie before YouTube has you covered. A little color is okay, but avoid too much flash. Avoid any type of pattern that might be controversial or distracting. Wear a belt and polished dress shoes. Women have more options than men, but the guideline to stay conservative is still key. A business suit with pants or skirt is always appropriate, but a dress or skirt and blouse are sufficient in most situations. If you wear a skirt, do not wear it too short. A hemline just above or below the knee is best. Avoid a brightly patterned skirt or dress. Instead, lean toward black, blue, or gray with subdued patterns. Wear a blouse with a simple pattern. Following the advice for men above, a pattern or mix of colors is a good way to hide the small stains that might result from spilled beverages or crumbs. Wear boots or pumps with heels less than 3 inches. Do not wear flip-flop, sandals, or flimsy shoes. Definitely avoid any shoes that make it difficult to walk. For jewelry, go for a clean, classic look. Small earrings and a wristwatch are fine. Don't overdress with rings, bracelets, and necklaces. Clunky jewelry can be distracting and even loud. Make sure you take some time to try everything on. Too often students show up to career fairs in ill-fitting clothes. Trying things on a few days before you attend a career fair will give you enough time to make any necessary adjustments.